Having lost my dad and aunt (his sister) to cancer exactly three weeks apart two months ago has been very painful for me. It brings me some peace to be able to pay tribute to them when I wear a silver bracelet with the Breast Cancer Awareness bead from Chamilia® Jewelry! 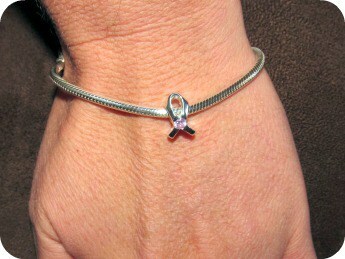 This lovely awareness bracelet features a Silver Snap Bracelet ($65) that is quite pretty in its simplicity. I selected the Breast Cancer Awareness Bead to honor my dad and aunt. The “Breast Cancer Give Back Program” bead ($45) is designed to feature a light pink cubic zirconia gem on the signature style silver bead. It shimmers beautifully and the bead and bracelet is of the highest quality. I wear my bracelet every day and feel confident that one day there will be a cure for cancer so that other loved ones are not lost to this terrible disease! Chamilia® Jewelry features a wide selection of beads, bracelets, earrings, locks, necklaces and starter sets. I love that I can choose from a wide variety of beads to add to my bracelet. A few of my favorites are the “Be Merry” Christmas inspired beads, Gingerbread Man bead and the Let It Snow Glitter Enamel Snowflake (so pretty!). The holiday inspired jewelry bracelets featured at Chamilia® Jewelry are absolutely gorgeous! For gift ideas for special women on my holiday list, I really like the Bead Drop Earrings ($75) and the Celebrate Mom Starter Set ($150). You are invited to visit the Chamilia® Jewelry website to browse the entire collection of high quality, attractively priced jewelry. Feeling creative? You can create your own customized bracelet by selecting your bracelet, adding beads and adding locks. If you need help selecting a gift there is a helpful section on the website dedicated to helping you find the perfect gift ideas and you can choose from price points, occasion, recipient etc. I think that bracelet is beautiful!! So simple and elegant. I have entered to try to win one of these because I absolutely love the looks of these! Very beautiful piece. Especially for it meaning. How beautiful! I just love the breast cancer awareness bead! What a great way to honor your loved ones, and so stylishly. And by adding other important event beads, you are wearing your important memories. Love the idea. Sorry for your loss 🙁 I’ve lost a lot of loved ones to cancer as well and my mother has battled it twice. I love the idea of this bracelet.